I was recently introduced to a quote about courage that I had never heard before: “Courage is not the absence of fear, but rather the judgment that something else is more important than one’s fear.” I had heard quotes like “Courage is not the absence of fear, but feeling the fear and doing it anyway” and such but this quote is different. While other quotes seem watered down, “…oh, yeah, just do it”, this one smacks of personal priorities, inner decisions, and moving forward in a decided direction regardless of barriers like fear. I pictured the man who wrote this as having a solid sense of himself and great inner fortitude. From the article “No Peaceful Warriors!” by Ambrose Redmoon, published in the magazine Gnosis in 1991. The full article was published in 1991, but was most certainly a response to Dan Milkman’s book The Way of the Peaceful Warrior, which was published in 1980. The first line is about “scars and a trophy” is intense. It immediately brought to mind my friend who aids marines with re-acclimating when they come home from combat. Through her, I have come to understand, in a very small way, our modern-day warriors; their training, their harsh experiences, their duty in eliminating an exterior enemy presence, and thus their need for courage. They have judged that something else is more important than fear: Their duty, their country, their brothers, all take precedence over their fear. They made this decision when they enlisted, before they trained out fear and trained in courage—the decision about their priorities was premeditated and the decision incorporated the potential loss of their own life. These warriors embody the quote in its shortened form, as (in my opinion) is the intention of the author. Yet, I wonder, how did “peaceful” become equated with “cowardice” for Redmoon? He says, “’Peaceful warrior’ is far more than a contradiction in terms. The function of a warrior is to eliminate an exterior enemy presence. Cowardice is a serious vice.” Peaceful in the first sentence becomes cowardice in the third sentence. Doesn’t working toward being peaceful require the same pre-meditated decision that there is something more important than fear? Doesn’t peace require training—learning to behave in a certain way, regardless of emotions or external happenings? Does this decision and subsequent behavior not require strategic and committed discipline to be able to act on the conviction? The clue lies in Redmoon’s definition of warrior: “the function of a warrior is to eliminate an exterior enemy presence.” Cowardice is a serious vice but the enemy is not always external. 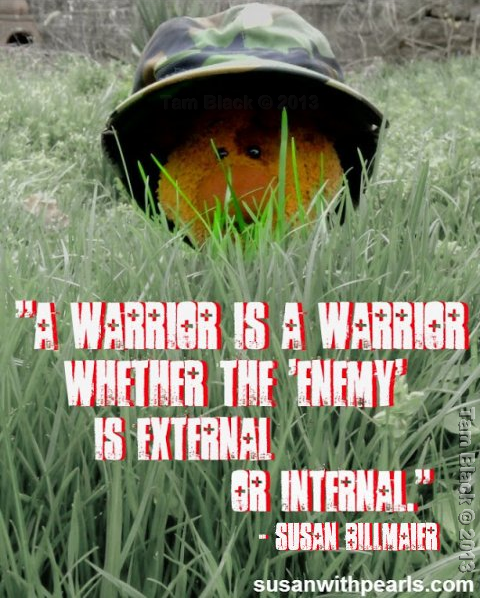 Perhaps a warrior is a warrior whether the “enemy” is external or internal. Sometimes the enemy is fear of the future, fear of loss, grief, depression, lack of self-confidence, feeling stuck or immobilized, not knowing which way to turn, or feeling alone; anything that disrupts peace becomes an internal enemy. In the midst of such emotions and their corresponding behaviors (oversleeping, over-eating, self-medicating, doing nothing, etc. ), it takes a judgment about what is important and an inner choice to act on it: it takes courage. “To take action when one is not afraid is easy. To refrain when afraid is also easy.” Pulling oneself up from any depth of emotion, making a decision about moving forward, and acting on it is hard. It is courageous. As I said, I picture Ambrose Redmoon as a man with a solid sense of himself and great inner fortitude. I picture a man with both inner and outer courage. I then learned he had been in a car accident in his thirties which left him wheelchair bound for three decades; it only strengthened that imagining. I wonder now how fiercely he fought his inner enemies, if he saw himself as an inner-warrior, fighting for his own peace, fighting his battles alone, without military brothers at his side. I wonder if he gave himself enough credit, in recognizing his inner warrior.